What is it: See healthy, beautiful skin. Formulated with Lychee, Bamboo Grass and Cordyceps Mushroom extracts, this high-powered formula helps give skin the energy it needs to look fresher and younger. Super silky emulsion floats over skin's surface for a flawless yet natural look-instantly and day after day. 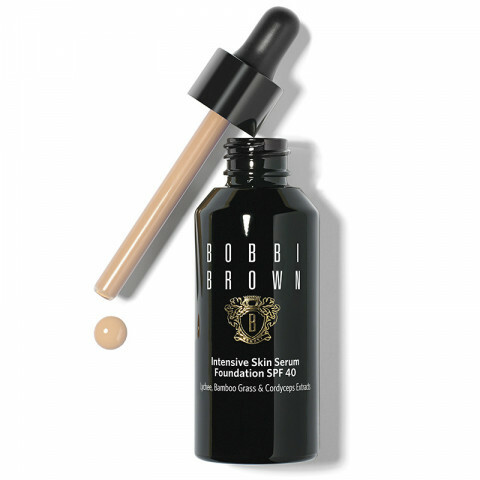 Who is it for: Normal to dry skin types- anyone who wants the treatment benefits of a serum combined with the flawless, skin tone correct coverage of Bobbi's foundations. Ideal for normal to dry skin. Why is it different: Goes beyond the surface, beautifying skin with a powerful combination of serum ingredients. Helps support skin's cellular energy and also offers key anti-aging benefits for a smoother, firmer, more lifted look. Ultrafine pigments cover imperfections without settling into fine lines. Plus, SPF 40 helps prevent future damage. How do I use it: First, shake bottle well. Pull the dropper out halfway. Squeeze and hold the bulb while reinserting dropper completely into the bottle, then release. Remove dropped from bottle and squeeze bulb to dispense foundation onto hand or brush. Apply foundation around the nose and mouth, and anywhere you see redness or unevenness. Blend with a Foundation Brush, sponge or fingertips. this foundation gives great coverage, is buildable, and gives your skin a natural finish. lasts for hours without looking cakey and oily. great for dry skin types. Gives nice coverage, very fluid and long lasting. Blends smoothly and gives great coverage. Lasts well through the day without too much oil. This foundation is build able, and blend in smoothly into the skin. It does have a herbal scent but will quickly disappear once the foundation settles. Best applied with fingers, this foundation blends seamlessly into the skin. Great lasting power on my oily skin too! Best applied with fingers, this foundation blends into the skin so seamlessly. Great lasting power on my oily skin too! I use this foundation in the winter, because it does not make my skin dry. I would recommend this foundation for winter.